Our distinctive arch window coach from the Erie Railroad was one of a large number of coaches that made up the railroad’s commuter fleet used in suburban New Jersey and Cleveland. Built by the Standard Steel Car. Co. of Hammond, Indiana in June, 1926, the car follows the distinctive design created by Lewis Buckley Stillwell, a pioneering electrical engineer and industrial designer who consulted for the railroads. In an age when the majority of railroad rolling stock was of wooden construction, all-steel cars were still somewhat of a novelty. 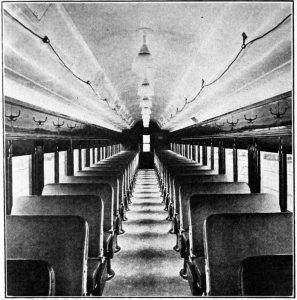 Stillwell was retained by the New York, Westchester & Boston (subsidiary of the New Haven) to design its fleet of electric multiple-unit coaches, and was the first to order cars following his design in 1912, and again in the 1920. After the NYW&B shut down in 1938, the cars were transferred to the New Haven where they were converted into coaches for Boston commuter service. Some cars were purchased by the government and used to transport workers to in the western oilfields and shipyards during the second World War. The Erie Railroad ordered their first Stillwell-designed coaches as early as 1915, looking forward to the day when they might electrify their suburban commuter operations. The Erie Stillwell cars were built without electrical gear, but left the provision for conversion in the future. With features selected specifically by Erie president F.D. Underwood, these were the most modern passenger cars of the day. 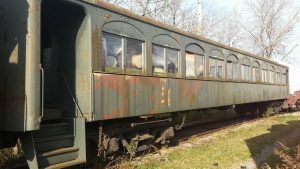 Our car was retired from regular service in the mid-1950s, gutted and completely rebuilt as a “camp car” to house railroad personnel working at remote construction projects along the railroad. It was assigned to company service and became part of the Erie Lackawanna fleet after 1960, becoming No. 489008. Meanwhile, many of its brethren continued to serve New Jersey commuters up until the early 1970s. Our coach survived into the Conrail days, only to be deemed excess and sent to scrap in 1982. 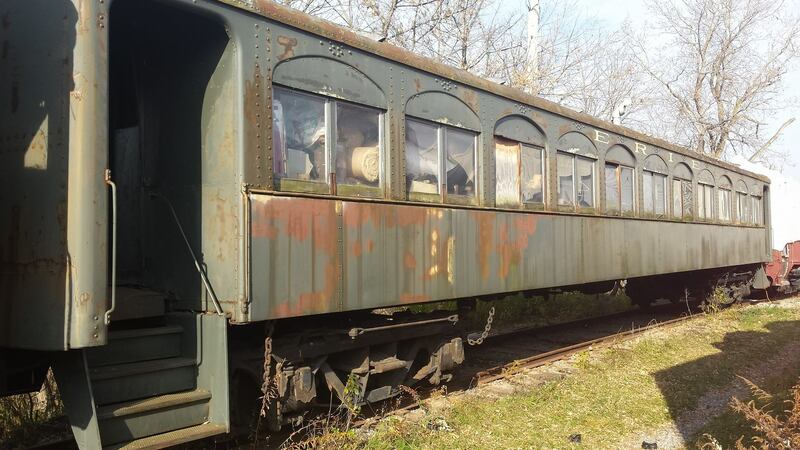 It sat in the Schulman & Sons scrap yard in Elmira, N.Y., until it was discovered by volunteers from the Rochester & Genesee Valley Railroad Museum in 1985. The Schulmans were gracious enough to donate the car to our organization for preservation, but we still had to rebuild the brake system to make it ready for movement over Conrail to our museum. After nine months of searching, the proper parts were found to repair the brakes, and it left Elmira in June 1986. Upon arrival at Industry, substantial metal work replaced rusted and rotten side panels. Other areas were repaired and patched, while volunteers evaluated the interior. The car is used as occasional workshop space by our volunteers. Presently, the car is a candidate for a multi-year restoration and rebuilding. This car is not currently on public display.